Note: this accessory kit does not include the actual TravelMike but rather accessories to be used with the TravelMike. Attached to notebook USB port: this is the default method of attaching the TravelMike to your computer. You don't need the accessory kit for this method! Attached to notebook lid: this method is facilitated by small Velcro strips included in the accessory kit and the 18 inch USB extension for connection to a nearby USB port. Free-standing: One of the components of this kit is a universal card reader that in addition to a bunch of card reading slots, includes 3 USB ports. This card reader includes a 32 inch cable to connect to your computer and serves as a perfect mounting base for the TravelMike. Unique to this base is the fact that the surface with the ports is angled forward, so it has the effecdt of pointing the TravelMike in your direction. When attached to the base, you can move the TravelMike to any convenient position on your desk, including a position closer that the location of your computer's USB port. And for those using a desktop computer, this set-up allows use of the TravelMike when it would otherwise not have been possible. Finally, we include a 2 inch jack extender which can be placed between the MultiAdapter (guts of the TravelMike) and the snub-nosed microphone to give it a little more reach. Hand-Held: With the TravelMike attached to your computer using the simple 1 meter long USB extension cable included in this accessory kit you can turn TravelMike into a superbly performing hand-held microphone. Although it lacks the buttons present on most commercially available hand-held USB microphones, the single button on the TravelMike serves as a simple way to mute the microphone when needed. In our prolonged testing in a fairly loud doctor's dictation room, we have found that with the TravelMike set to the blue or "normal" mode, this works beautifully as a hand-held mic and deals perfectly with external noise. Comments: This accessory kit is designed for the person that has already purchased the TravelMike. 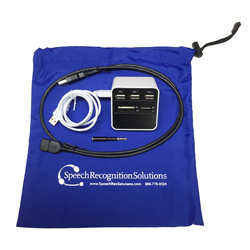 If you have one of the older versions of the TravelMike with longer flexible boom, we recommend that you consider upgrading to the newer snub-nosed microphone (you get this by purchasing the "TabletMic"). If you have not yet purchased a TravelMike, you should not buy this accessory kit separately, since you will save funds if you buy the TravelMike bundled with the Accessory Kit (see related products below). In terms of quality and usability, while we always liked the TravelMike, we found it a bit limiting due to it's fixed position on the computer. This kit truly extends the functionality of the TravelMike and even allows you to alter your set-up from day-to-day or hour-to-hour depending upon the environment and your needs. One final comment: if you choose use the TravelMike with the portable base and use the jack extender, the center of gravity of the set-up is a bit forward and while it stands up fine, it doesn't take much to tip it forward. If you find this to be an issue, we recommend that either you don't use the jack extender or simply tape your favorite half-dollar to the back of the base and you'll be fine.